Welcome to the spring season! Many aspects of the grounds operations will begin to bloom. Annual maintenance of preparing the Har-Tru tennis courts is underway, bulbs in various locations are sprouting as soil temperatures slowly rise and the South Course will open on April 9th. During the last half of March, our staff hollow-tined the playing surfaces on the South greens, tees and fairways. We will perform a very similar aeration program on the North Course April 22nd through 24th, weather permitting. Mother Nature will dictate healing time of these surfaces, but our staff will push growth as much as possible through light fertilizer applications during the month. On the topic of aeration, we are happy to announce a change to the annual maintenance program. There will be no August aeration of either golf course. It is our intention to keep the coring of the South Course to months that are less impactful to playing surfaces. As we continue to modify programs using test data from soil reports, it is our plan to aerify the South Course again in November and cover the greens with permeable tarps during the winter to aid the healing process. We will continue to aerify the North Course after the South Course has opened in April of each year. We will return in October to core, when it is more beneficial for healing of the mixed surfaces of bentgrass/ Poa annua. Although the month of August, is light in terms of play with vacation schedules, this time of year is when the playing surfaces on both golf courses are at their weakest. It does not make any agronomic sense to core aerate areas after they have gone through a twelve-round heavyweight boxing match, which we consider the eight weeks from the end of June through mid-August. Furthermore, as weather patterns have changed, the month of September is a continuation of high night-time humidity. The decision to change timing of aeration is based upon what is best for our playing surfaces in regards to plant health. Keep in mind, there will be times we need to “air-ify” turf areas, especially the putting surfaces. In these instances, we will use a small, solid tine for the exchange of oxygen in the soil below. We can expect this to occur during times of extreme heat and humidity, coupled with saturated conditions. Plant health takes into account many factors, two of which are sunlight and wind circulation. With this in mind, we have removed a few obstructions on the golf courses to improve growing environments for green complexes. The pictures to the right are from the app called Sun Seeker. 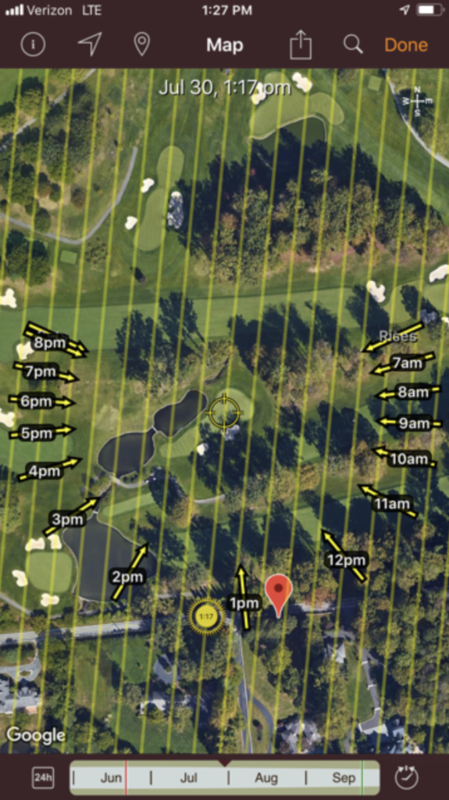 This use of technology allows our team to evaluate areas blocked from morning sunlight, the most critical for the health of our greens. Sunrise can be viewed for every day of the year and determinations can be made which obstruction is most critical and needed for removal. 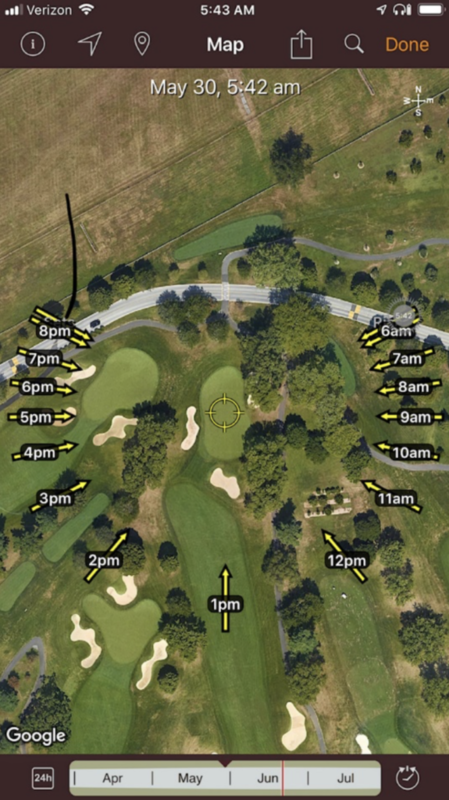 With the data provided by the app, we have selectively removed a few trees to increase avenues of sunlight at each green complex for 5 South and 8 North. As we continue to evaluate growing mediums, we will use this data to make sound decisions for removals. In addition, new plantings will be forecasted with this technology, to eliminate the need to remove trees in the future as they mature. In last month’s update, we mentioned the use of phenological indicators to apply pre-emergent materials for weeds such as crabgrass. When forsythia is at full bloom, with a few green leaves on the stem, this is the perfect time to apply for crabgrass. Excessive moisture from rain events will limit the efficacy of the product applied. It is recommended splitting the application over a two to four week interval for the best control of grassy weeds. From of all in the Grounds Department, we hope April will kick off a great season of sporting activities for you and your families!